While looking for my great grandmother’s father, I came across this document from the Freedman’s Bank. The name was right, Robert Allen and Clara was my great grandmother’s name. However, her father was said to be white and this one was black. And the county was wrong. 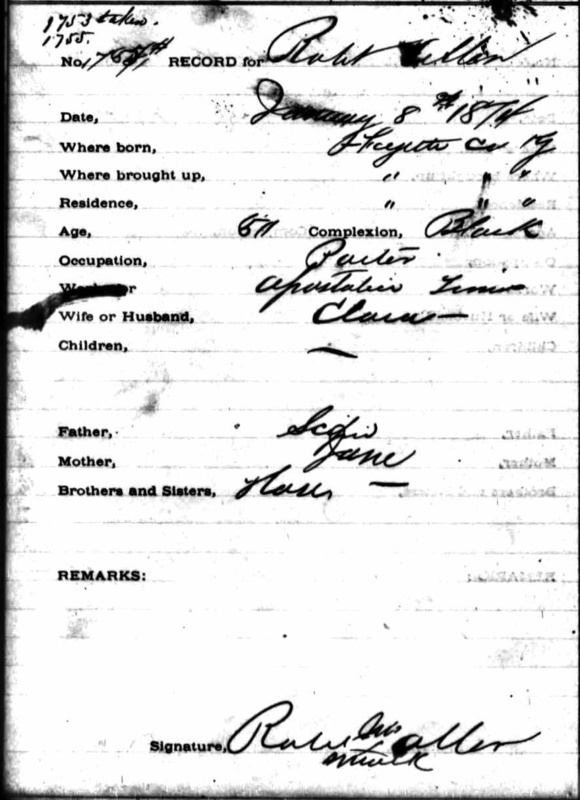 My Clara was in Marion County, Kentucky for the 1870 census and the 1880 census. This Robert was a lifelong resident of Fayette County. This was not the Robert Allen I was looking for. However, this form contained a lot of information and I thought it would be interesting to find out more about him for A to Z.
Robert Allen was born into slavery about 1824 in Fayette County, Kentucky. His parents were Scipio and Jane. He had no siblings and no children. His wife’s name was Clara. Robert Allen worked as a porter at Apostalic Times. He was dark complected and 50 years old. The form was filled out on January 8, 1874. With all that information, I expected to be able to find him in the 1870 census and perhaps in a directory or in the 1880 census. Maybe a death record. I found nothing. Perhaps he went by a middle name or lived at the end of a road that wasn’t enumerated. It’s really rather sad, isn’t it, how many people just disappear into history. We’ll never know their story. It seems a sad loss. It seems to happen to the majority of people. Unless you write your story and share it, who will remember? I believe that is Apostolic Times. It was in print in Lexington, KY from 1869-1885. I believe you are right and I’ve made the change. Thank you! So much valuable information was lost between the 1880 and 1900 census. So frustrating! There was but in this case it would have been good to find him in 1870 and 1880!